Train crossing the Prince-of-Wales Bridge around 1910. It was opened to rail traffic in 1880. E.B. 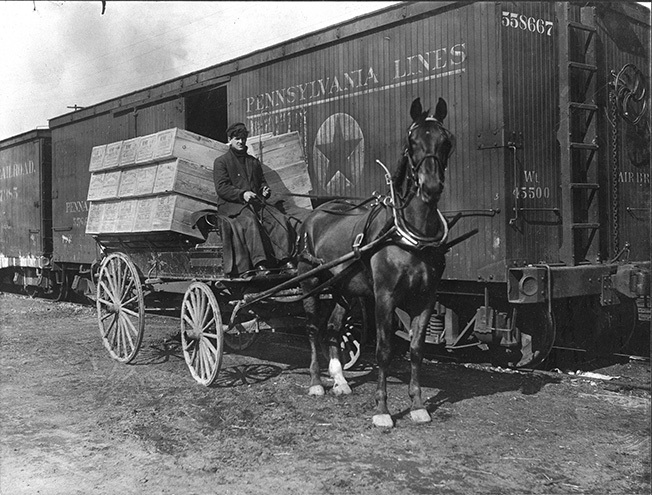 Eddy Company horse-drawn delivery wagon filled with match cases waiting to be loaded into a Pennsylvania Lines Railway box-car around 1920. Carte montrant Map showing the extent of the Riordon Pulp and Paper Company timber limits in 1912. But the interest of this map lies elsewhere. In one glance, we are made to appreciate the importance of the rail network which serves the Ottawa Valley, in the Ottawa-Montréal District, at that point in time.l’ampleur des concessions forestières de la Riordon Pulp and Paper Company en 1912. Son intérêt réside ailleurs. D’un coup d’œil, nous sommes en mesure de cerner l’importance du réseau de voies ferrées qui dessert le bassin de l’Outaouais, dans l’espace Ottawa-Montréal. 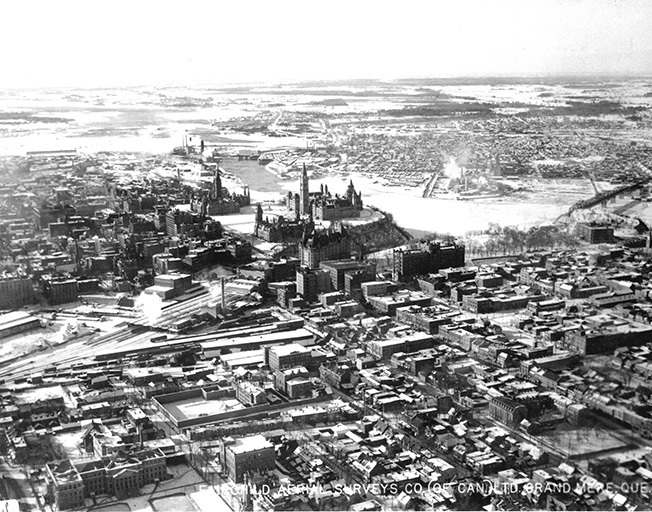 Plunging view of Ottawa in 1926. At the centre of the photograph can be seen Parliament Hill, the Rideau Canal and the long train sheds that stretch behind Union Station. Far off, in the background, can be seen the industrial sector of the Chaudières Falls and the City of Hull. 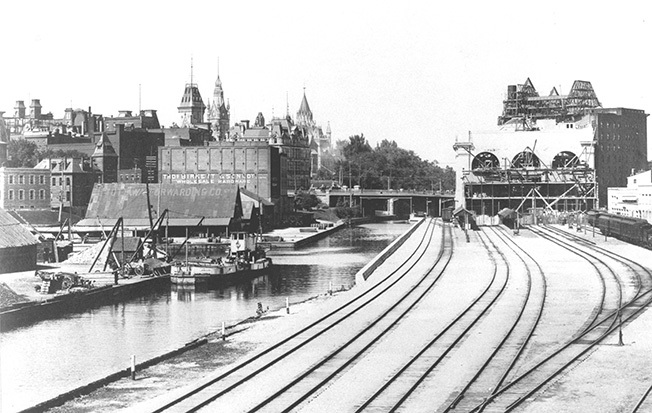 The Grand Trunk Central Station in the process of being built on the East shore of the Rideau Canal in Ottawa around 1910. Officially opened on June 1st 1912 that train station is renamed Union Station on January 4th 1920. Behind the steam-boat which is moored on the bank of the canal are some of the buildings that will eventually be razed to make space for today’s National Arts Centre. View of the marshalling yards and railway sidings that stood behind Ottawa’s Union Station and alongside the Rideau Canal around 1920. Engine-shed or roundhouse for steam engines located near the Prince-of-Wales Bridge around 1920. E.B. Eddy Company horse-drawn delivery wagon filled with heavy rolls of Eddystone News newsprint waiting to be loaded into a Canadian Pacific Railway box-car around 1915. 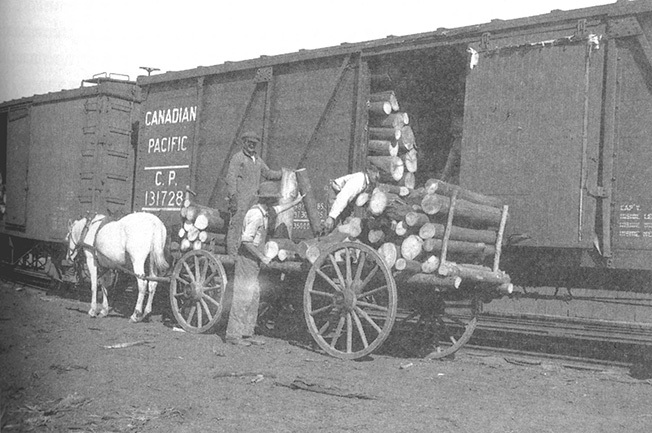 Transfer of a load of four-foot long pulpwood bolts in a Canadian Pacific Railway box-car in Kazabazua around 1924. 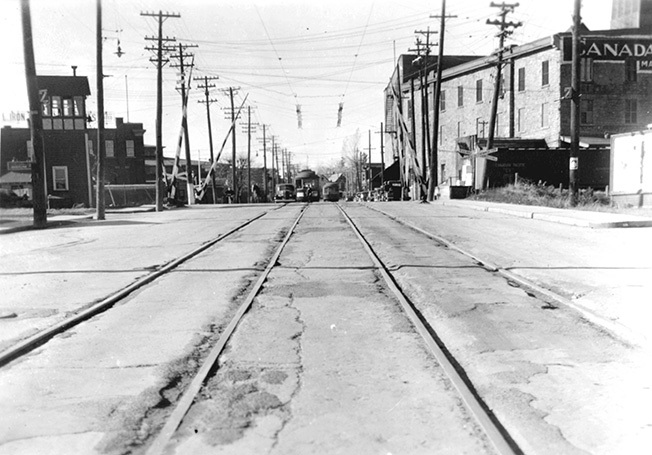 Tramway tracks of the Hull Electric Company on Montcalm Street, near the Canada Packers establishment around 1940. To the left is to be found the West-Hull train station and a large marshalling yard with railway sidings. At the centre of the photograph can be seen the cross-road where two railroad tracks cross Montcalm Street. Steam locomotive and train arriving in Ottawa from Hull by way of the Royal Alexandra Bridge (Interprovincial Bridge) around 1920. In the background is Hull’s Notre-Dame-de-Grâce Church. 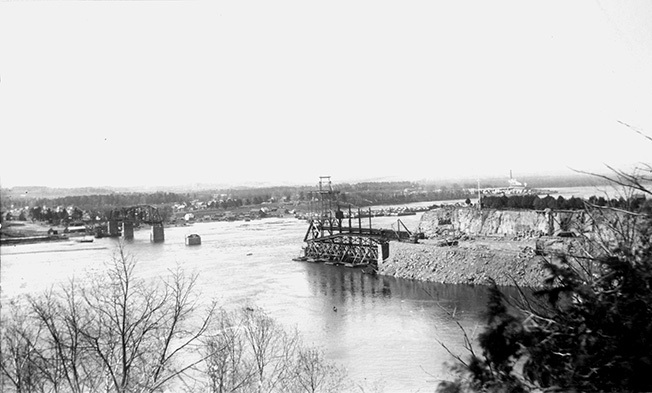 The building of the Interprovincial Bridge seen from the Ottawa side of the river in 1900. In the background on the Quebec shore can be seen the Ottawa Transportation Company’s small shipyard operated from 1892 to 1934 as well as the barges and tug-boats lined up along the shore. The impressive setting in place of the central span of the Interprovincial Bridge (Royal Alexandra) in 1901. The arrival of the railroad, which operated year-round, reduced the importance of water-borne traffic. And the train is much faster! Around 1890, it took more than ten days to travel the Ottawa-Burlington water route by using barges. In comparison, the time needed to deliver freight by rail from Ottawa to Boston, a much longer distance, was only four days1. That’s why for instance the James MacLaren Company, shut down its old “Basin” lumber yard at Masson in 1905, and opened a new one in Buckingham, where all lumber was exclusively shipped by rail. 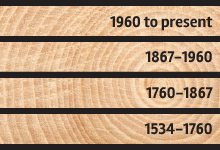 In 1906, a great deal of energy was invested in the liquidation of the Masson lumber piling grounds and in the modernizing of the old Ross sawmill2. 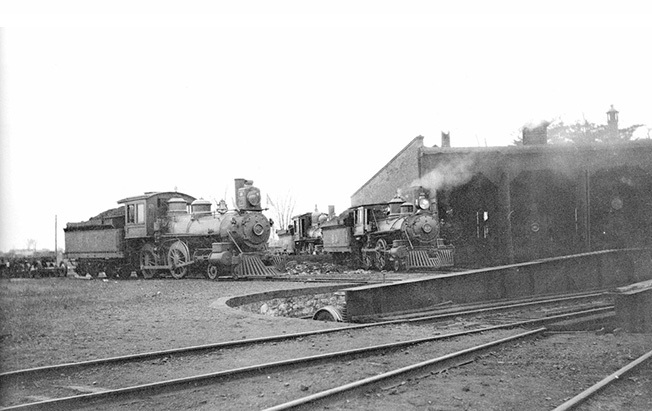 The construction of the Bytown and Prescott Railway, which was completed in 1854, was the first investment of importance by the Americans in the Ottawa Region. These Boston businessmen wanted to divert the Ottawa Valley lumber production towards their city, and their seaport. It also explains why, as early as 1850, they took control of the rail line connecting Boston to Ogdensburg, the American city located in across the St. Lawrence from Prescott Ontario.. Simultaneously, they spent large amounts to set up huge sawmills at the Chaudières Falls, the production of which was in part destined for the American market. Unfortunately, the success that they expected for their railway line was disappointing. They underestimated the costs associated with ferrying the St. Lawrence between Prescott and Ogdensburg as well as those linked to the trans-shipment at that crossing and in Ottawa. The fact that the lumber manufactured at the Chaudières Falls sawmills had to be transferred to the box-cars of their railroad at the Sussex Street marshalling yards, east of the Rideau River, was an expensive operation3. In the Ottawa Valley, rail transport becomes a serious alternative to steam navigation only at the beginning of the 1880s. Another railroad, the Brockville and Ottawa Railway, was also eager to divert the Ottawa Valley lumber production towards Brockville, by taking advantage of the fact that the Grand Trunk’s main line that was built alongside the St. Lawrence River gave easy access to the Montreal and Toronto regions as well as to the United States. As early as 1859, the Brockville and Ottawa line reached Carleton Place and headed towards Pembroke, finally arriving there in 1875. In the meantime, the Canada Central Railway was being built from Lebreton Flats in Ottawa to Carleton Place. These two amalgamated in 1878, and were bought out by the Canadian Pacific Railway in 1881, barely a year before the Quebec Government sold the Quebec, Montreal, Ottawa and Occidental railway, also to Canadian Pacific. The first railroad to connect the city of Hull to Montreal, Quebec City and the United States, , was the Quebec, Montreal, Ottawa and Occidental railway in 18774. In 1880, that rail line crossed over to Ottawa thanks to the building of the Prince of Wales railway bridge, a move that sets up a direct link between the Montreal Region and the Chaudières Falls sawmills and between the Chaudières Falls and the United States by way of Carleton Place and Brockville. In the last years of the nineteenth century, two other railroads would connect with the city of Hull. The Ottawa and Gatineau Valley Railway were built up the Gatineau Valley, reaching Wakefield in 1891, Gracefield in 1895 and Maniwaki in 1904. As for the Pontiac, Pacific Junction Railway, it went up into Pontiac County, reaching Quyon in 1884, Shawville and Fort-Coulonge in 1886 and Waltham in 1888. These last two companies will be swallowed up by the Canadian Pacific Railway in 1902, on year before the opening of the Interprovincial Bridge (Royal Alexandra) to rail traffic into Ottawa. At the end of the nineteenth and in the first decade of the twentieth century, the railroad companies take up a lot of territory. New firms come in to play. The Canada Atlantic Railway, one of John Rudolphus Booth’s brain-storms, linked Coteau Junction to the Chaudières Falls in 1883, a rail line that allowed him to ship wood from his sawmills straight through to New England. He extended this rail line westwards, right to Depot Harbour, on Georgian Bay. This move was doubly-successful in that it facilitated supplying his sawmills with lumber from the Ontario hinterland while opening up a new market – the wheat export trade to the United States. That company was merged with the Grand Trunk Railway in 1905, helping to break the near-monopoly of the Canadian Pacific Railway in the Ottawa Region. The Grand Trunk had the magnificent Union Station built in front of the Château Laurier, alongside the Rideau Canal, from 1907 to 1912. In 1898, the Canadian Pacific Railway, which had bought out the Vaudreuil and Prescott Railway, completed that rail line by connecting Rigaud to Ottawa. Eastern Ontario was also served by another rival railroad, the Canadian Northern Ontario Railway, which linked Hawkesbury to Ottawa from 1909 onwards. 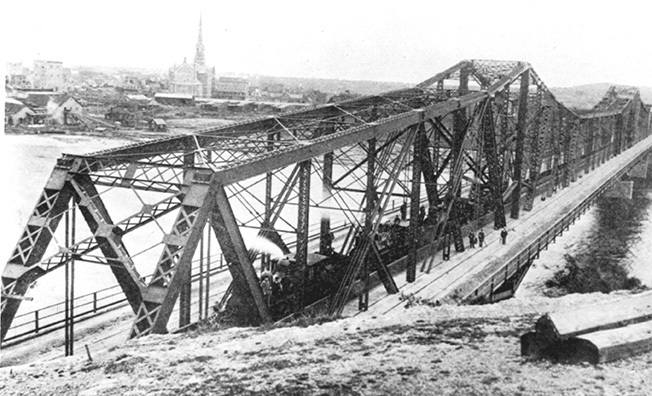 A railway bridge allowed the railroad to cross the Ottawa River at Hawkesbury and to reach Montreal by taking over the old Carillon and Grenville rail line. 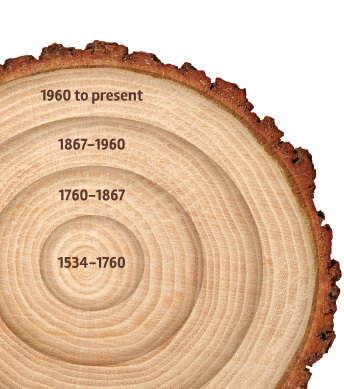 This excessive growth in the number of railroads and the decline of the sawn lumber industry were two factors that combined to drive many of these companies into bankruptcy5. Around 1916, things were so bad, that the Grand Trunk, the Grand Trunk Pacific, the Canadian Northern and many other Canadian railroads were going bankrupt. The Federal Government, tired of handing out grants, set up a Royal Commission to inquire into railways and transportation in Canada. The report was published in 19176. In order to reorganize rail transport in Canada, it was recommended to nationalize many of these companies and to create a Crown Corporation, the Canadian National Railways (CNR). The recommendations were adopted by the Government and from 1917 to 1923 the CN amalgamated the six railroad companies that were in dire financial straits. 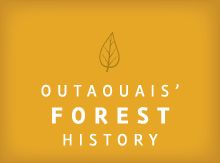 As can be seen, water and rail transport made up a large part of the economic spin-off that was linked to the development of the Outaouais’ forest industry. Most the economic effects went south to the United States7. Furthermore, the economic activity that was generated locally more often than not fells on the Ontario side of the Ottawa River. 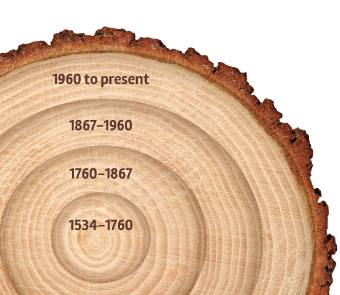 Most of the large sawmills were located there. 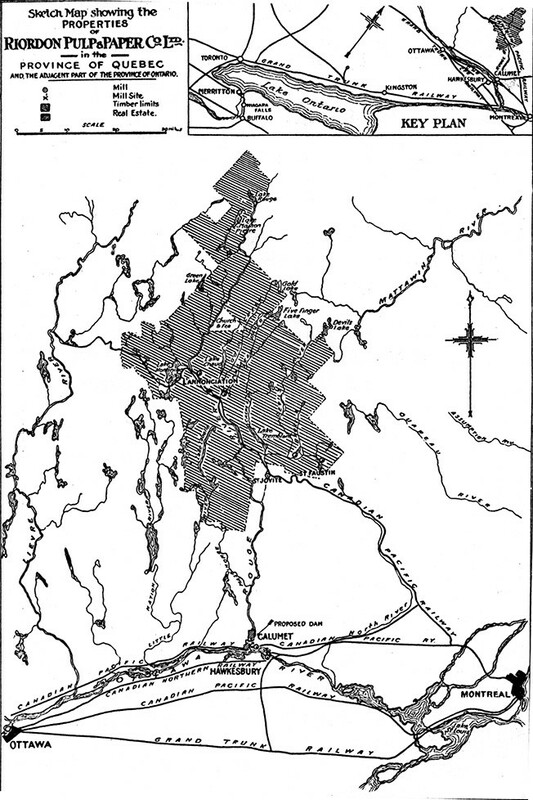 And Eastern Ontario, which was criss-crossed by the many railroad lines that linked the Ottawa Valley to the American market, was in a much better position to tap the downstream linkages of the Outaouais’ forest industry, more so certainly, than the north shore of the Ottawa River. 1 David Lee, Forest Products Industries in the Ottawa Valley, 1850-1925, Ottawa, Historic Sites and Monuments Board of Canada, 1985, pages 107-108. 2 BANQ-CAO, Archives of the James MacLaren Company, Letter Book M-81, pages 148-149 ; Estimated Cost-Yards and Letter Book M‑81, pages 351-352, 453, 471, 474, 589, 666, 670, 674, 683, 727-730, 783-784, 812, etc..). 3 Arthur R.M. Lower, The North American Assault on the Canadian Forest, Toronto, Ryerson Press, 1938, pages 56 and 111. Also: Albert Faucher, Québec en Amérique au XIXe siècle, Essai sur les caractères économiques de la Laurentie, Montréal, Fides, 1973, pages 45, 65, 103 and 134-138. In 1871, the transhipment problem wass already solved for Ottawa. The building of a branch line linking the Chaudières Falls to the Sussex marshalling yards put an end to it. 4 Most of the chronological data linked to the history of railroads in the Ottawa Region was drawn from Colin Churcher’s remarkable Railway Pages at: http://www.railways.incanada.net/candate/ottawa.htm. 5 William L. Marr and Donald G. Paterson, Canada: An Economic History, Toronto, The MacMillan Company of Canada, 1980, p. 321-331, “The Transcontinentals”. 6 Canada, Royal Commission on Railways and Transportation (1916-1917). Report of the Royal Commission to inquire into railways and transportation in Canada. Ottawa, J. de L. Taché, King’s Printer, 1917. 7 A.R.M. Lower, op. cit., p. 95-96 and 109. Albert Faucher, Québec en Amérique…, p. 25-26. Source: Pierre Louis Lapointe Collection. Photographer: George Wilfred Broadhead. 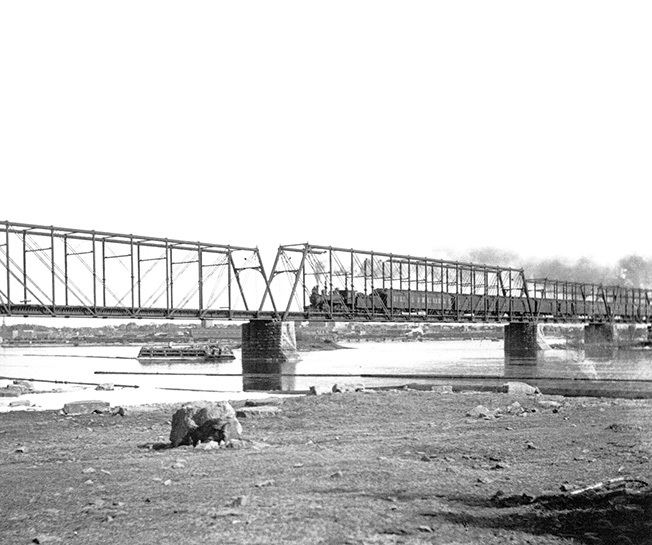 Caption: Train crossing the Prince-of-Wales Bridge around 1910. It was opened to rail traffic in 1880. Source: Canadian Museum of Civilization, photograph No 73-425. Caption: E.B. Eddy Company horse-drawn delivery wagon filled with match cases waiting to be loaded into a Pennsylvania Lines Railway box-car around 1920. Source: Canada Lumberman and Woodworker, November 15th 1912, p. 32. Caption: Map showing the extent of the Riordon Pulp and Paper Company timber limits in 1912. But the interest of this map lies elsewhere. In one glance, we are made to appreciate the importance of the rail network which serves the Ottawa Valley, in the Ottawa-Montréal District, at that point in time. Source: Bibliothèque et Archives nationales du Québec. Centre d’archives de Québec. Aerial photograph, Fairchild Aerial Surveys, No 1273-28. Caption: Plunging view of Ottawa in 1926. At the centre of the photograph can be seen Parliament Hill, the Rideau Canal and the long train sheds that stretch behind Union Station. Far off, in the background, can be seen the industrial sector of the Chaudières Falls and the City of Hull. Source: Library and Archives Canada, C-5227. Photographer unknown. Caption: The Grand Trunk Central Station in the process of being built on the East shore of the Rideau Canal in Ottawa around 1910. Officially opened on June 1st 1912 that train station is renamed Union Station on January 4th 1920. Behind the steam-boat which is moored on the bank of the canal are some of the buildings that will eventually be razed to make space for today’s National Arts Centre. Source: Pierre Louis Lapointe Collection. Photographer unknown. 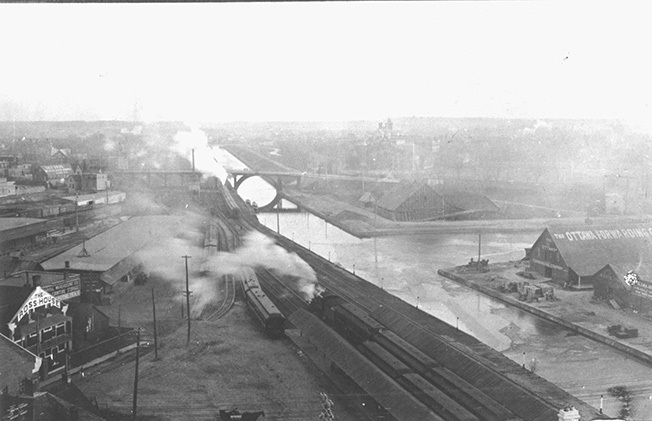 Caption: View of the marshalling yards and railway sidings that stood behind Ottawa’s Union Station and alongside the Rideau Canal around 1920. Caption: Engine-shed or roundhouse for steam engines located near the Prince-of-Wales Bridge around 1920. It’s a train shed where the steam engines are parked. In front of the building can be seen a steel turn-table on which there is a set of rails that can be connected to tracks radiating in all directions. On its arrival on the turn-table, the engine can be wheeled into any stall that’s vacant, rolled out in a similar fashion or simply turned around in order to return in the direction from which it came. All this was because the old steam locomotives could only back up with great difficulty. Source: Canadian Museum of Civilization, photograph No 73-424. Caption: E.B. 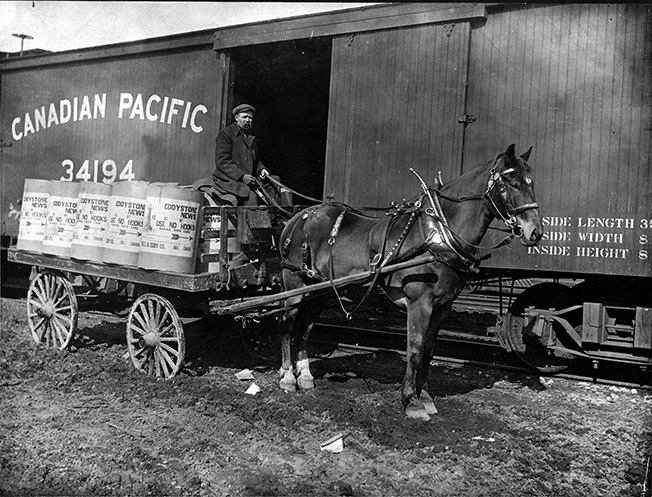 Eddy Company horse-drawn delivery wagon filled with heavy rolls of Eddystone News newsprint waiting to be loaded into a Canadian Pacific Railway box-car around 1915. Source: Library and Archives Canada, RD-133, John Boyd Fonds. Caption: Transfer of a load of four-foot long pulpwood bolts in a Canadian Pacific Railway box-car in Kazabazua around 1924. Source: City of Gatineau Archives. Call No V12, D4, P1. Photographer unknown. Caption: Tramway tracks of the Hull Electric Company on Montcalm Street, near the Canada Packers establishment around 1940. To the left is to be found the West-Hull train station and a large marshalling yard with railway sidings. At the centre of the photograph can be seen the cross-road where two railroad tracks cross Montcalm Street. Source: City of Gatineau Archives. Call No V-12-719. Photographer unknown. Caption: Steam locomotive and train arriving in Ottawa from Hull by way of the Royal Alexandra Bridge (Interprovincial Bridge) around 1920. In the background is Hull’s Notre-Dame-de-Grâce Church. Source: Canadian Museum of Civilization, photograph No D2003-5036. Photographer: William Horner. 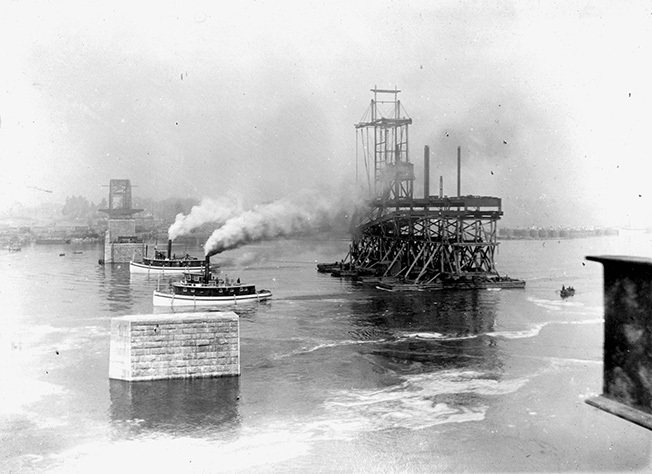 Caption: The building of the Interprovincial Bridge seen from the Ottawa side of the river in 1900. In the background on the Quebec shore can be seen the Ottawa Transportation Company’s small shipyard operated from 1892 to 1934 as well as the barges and tug-boats lined up along the shore. Source: Canadian Museum of Civilization, photograph No D2000-31-12. Photographer: William Horner. Caption: The impressive setting in place of the central span of the Interprovincial Bridge (Royal Alexandra) in 1901.